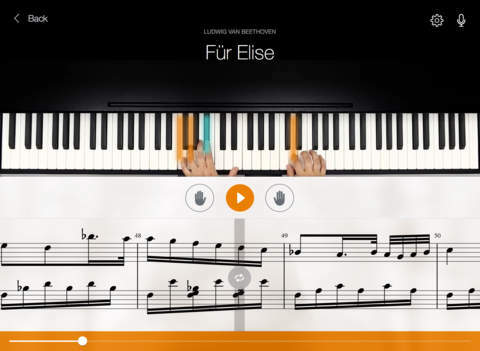 Flowkey is a free learn-to-play piano app for the iPad from developer flowkey GmbH. Learning to play an instrument takes time and practice and often involves costly one-on-one teaching. 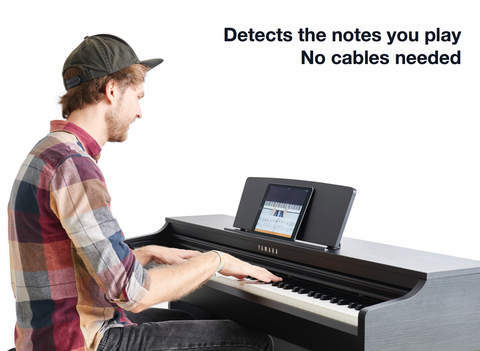 Flowkey is an innovative app that goes some way towards replacing the piano tutor by providing realtime feedback on the notes that you play, as you play them – right from your iPad. Using your iPad’s microphone, Flowkey detects the notes in the song you’re playing and lets you know if you’ve made an error. 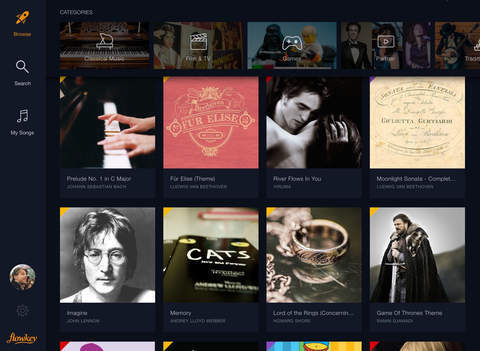 The app comes pre-loaded with a number of free songs, with access to hundreds more songs across a range of genres with subscription to the Flowkey’s Premium service. Flowkey has a number of features to assist the novice including the pairing of traditional sheet-music with images of key positions on the one screen. You can watch how your hands should move, and also listen to how the song should sound. You can also slow down music – perfect for when you’re first learning to play a new song – or loop any section of it if you’re struggling with a particular piece of the music. Flowkey is a free app to download and try, with a subscription service through iTunes available from $19.99 for one month, $38.99 for three months and $119.99 for one year. This may seem quite expensive when compared with some other piano apps in the $2-5 range, but few have the features of Flowkey. Compared with the cost of a piano tutor, Flowkey is quite affordable – even on a 12 month subscription – and it’s designed to replace, at least in part, that one on one teaching experience. Perfect for novice and intermediate piano players, Flowkey is an app for iPad that provides excellent note recognition and realtime feedback on your playing. Coupled with a wide selection of music across many genres, Flowkey represents a fantastic tool to help you improve your muscial technique and skill. Flowkey requires iOS 8.0 or later. Compatible with iPad.